A near-future science fiction thriller that is a breath of fresh air in terms of new ideas, writer and director Christopher Nolan demonstrates in Inception that originality is alive and well, and action movies need be neither derivative nor interpretations of obscure comics. Dom Cobb (Leonardo DiCaprio) specializes in modern industrial espionage: stealing ideas by invading the dreams of executives. Dom has unresolved emotional issues related to the death of his wife Mal (Marion Cotillard); as a result her image frequently appears and disrupts his progress at critical points in his invasive work. 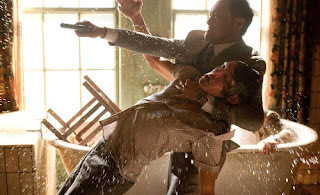 Businessman Mr. Saito (Ken Watanabe) hires Dom for a special assignment: conduct an inception by invading the dreams of rival executive Robert Fisher (Cillian Murphy) and planting an idea that will benefit Mr. Saito's business interests. An inception is the opposite of a theft, and is rarely successful, but Cobb assembles a crack team to pull it off. His associates include architecture student Ariadne (Ellen Page), a couple of other expert thieves, and a chemist specializing in dream-related sedation. The inception operation will require an elaborate dream within a dream within a dream structure, and the whole team may be forever lost in limbo if the plan fails. An extra complication for Dom is dealing once and for all with his emotions surrounding Mal's death. Inception is both challenging and complex to follow, but in an era of cookie-cutter sequelitis, a movie that demands attention is a good thing. Nolan spent 10 years developing the script, and it shows. Inception has an elaborate structure resembling Matryoshka nesting dolls, with fine threads connecting events happening in several dream dimensions at once. Knowing what is real and what is a dream is a challenge for both the characters and the viewers. The main heist involves three dream levels, and when things go wrong an unscheduled descent into a fourth dream level becomes necessary. All events in each of the levels are interrelated, and it's not an easy task to keep all the action straight. Nolan pulls this off with a combination of slick editing and sheer bravado, helped by a dedicated Leonardo DiCaprio performance. The movie does suffer from some routine, prolonged, and unconvincing shoot-out sequences, as Dom's team unexpectedly encounter heavily armed defenders in the dreams of Robert Fisher. The sequences revealing Dom's history with his wife Mal are better, and that is where the film finds it's emotional high points. Inception is a showcase for some incredible modern movie special effects, but in addition to being justified as part of various dream worlds, they are placed at the service of a fascinating story and engaging characters. Demonstrating an appreciation for old-school film elements, Nolan also brings in Michael Caine for a few scenes to add acting depth as DiCaprio's father-in-law. Inception inspires awe and head-scratching in equal measures, and the best proof of its impact is that it demands to be viewed again, as soon as it ends.